As we continue exploring the undercity along the riverbanks, the structures take on a much different feeling. Remnants up here are really that – the remains that didn’t get filled in, but just built over. Things get wetter as river water seeps into these basements and ruins, and of course, sections were sealed off in the process of building the sewers during the last Ditlana. 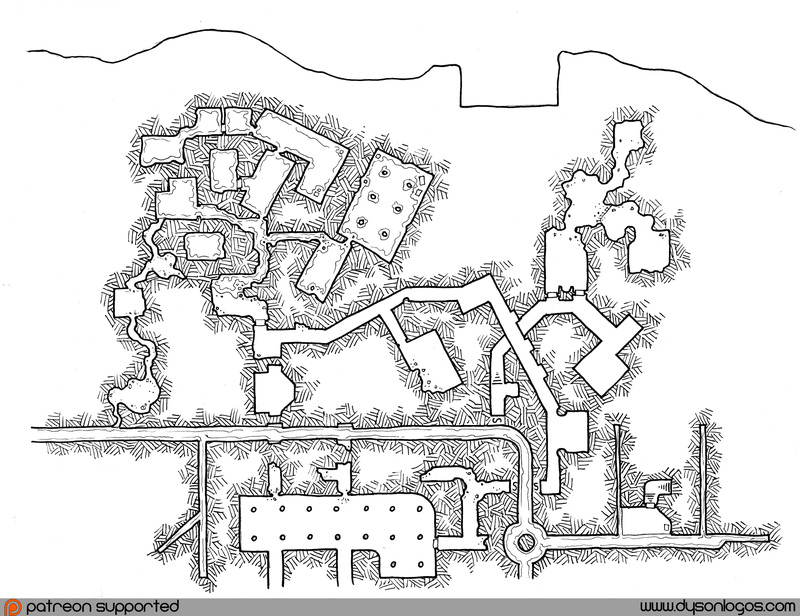 The largest section of this map is a series of interconnected flooded basements. Pressed down into the riverbanks and unmaintained, these spaces have flooded and have been interlinked by something that lives down here – perhaps ghouls, or something altogether alien that has settled here. This map is relatively isolated from the overall undercity – accessed by wandering down the sewers from map 1R, or through secret doors to the already isolated sections of map 1P. The flooded basements have been sealed off from the surface for a generation or more now, but the moisture seeps up and the housing here suffers from it. The only surface access is a sewer maintenance access on the lower right. I’m particularly happy with how this section came together. It feels run-down and decrepit – a reminder that there’s a lot of garbage under the city – that the history of the place isn’t all grand temples, cults, and the great clans – but also half-assed construction work, forgotten soggy places, and crumbling debris. I love your vision of the Jakalla underworld. These maps are truly amazing. I can’t wait to explore them. I was analyzing the heigh levels of this series and found that the maps 1K and 1M are at different heights which can cause a bit of confusion. Yeah, I had this discussion with a Patron previously and will be adding appropriate stairs to fix the problem prior to a final release. We’re almost done level 1. 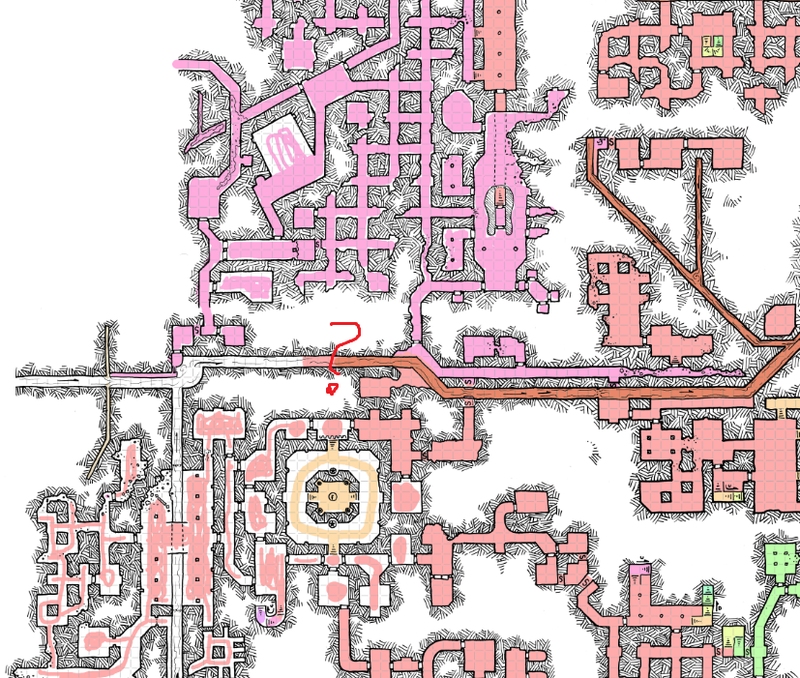 Then I need to map the city that sits above it, probably a few outlying areas that don’t connect directly to the main undercity, and then to the lower levels. For those interested…here is an image of the original map by the Professor. Many times have I sent players to their doom on that lovely wicked map. Last time was a TPK in the tomb of Queen Nayari of the Silken Thighs’ lesbian lover.